You will be pleased with the fine selection of best Kauai hotels that are available to couples and families when you visit the Garden Isle. You can choose from luxury accommodations on the north shore at St. Regis Princeville Resort or on the south shore at the larger Grand Hyatt Kauai Resort and Spa. You can stay along the Coconut Coast at the Aqua Kauai Beach Resort or you can stay the more budget friendly Courtyard Kauai at Coconut Beach. There are ideal boutique hotels like the Koa Kea Hotel and Resort as well as the Garden Island Inn. 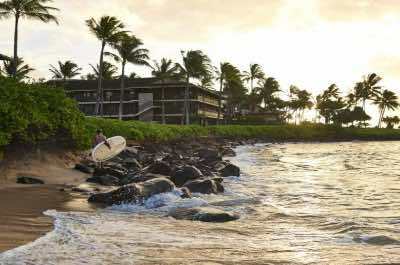 If you are seeking condominium accommodations then try Koloa Landing Resort or stay at Marriott’s Waiohai Beach Club. No matter where you stay you will find easy access to several exciting attractions that are located nearby these fantastic hotels. When you are seeking a luxury boutique Kauai hotel, then the Koa Kea Hotel and Resort is the best choice for you. Located on the south shoreline of the island in Poipu, the Koa Kea Hotel and Resort is situated on a portion of Poipu Beach which is ideal for snorkeling. The Koa Kea Hotel and Resort has a modern three-story architectural style with 121 rooms and suites that have a beach chic decor. Guest rooms start at 364 square feet with a private balcony with views of the gardens, ocean or oceanfront. One-bedroom suites are larger at 720 square feet with a separate living room and private balcony with an ocean or oceanfront view. The Koa Kea Hotel and Resort is ideally located on a section of Poipu Beach which offers excellent snorkeling just offshore as well as surfing lessons onsite and beautiful sand to relax upon. You are within a 2-minute walk to Kiahuna Beach for great swimming as well as Waiopai Beach which is perfect for surfing. You can arrange other watersport activities with the concierges or at one of the beaches. The Koa Kea Kauai hotel is directly across the street from Poipu Shopping Village, Spouting Horn is a 5-minute drive and the National Tropical Botanical Gardens is nearby. There is a small and shallow freshwater swimming pool with a nice deck for lounging that has poolside service. The property contains a fitness center, shopping boutique and full service spa. Dining includes the Red Salt Restaurant which serves a buffet-style breakfast and superb dinners. Offsite dining choices nearby would include Puka Dog for quick bites; Plantation Gardens Restaurant for seafood and Brennecke’s Beach Broiler is ideal for sunset dinners. In the evening you can watch the sunset at the lounge or attend the nearby Aulii Luau for entertainment and you can find live music at Keoki’s Paradise. If you want to find the premier luxury Kauai hotel that is ideal for couples and families, then you need to try the St. Regis Princeville Resort. 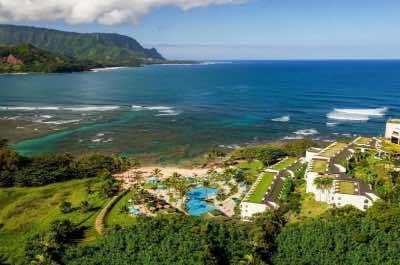 Located on the northwest shore of the island within the 9,000-acre resort community of Princeville, the St. Regis Princeville Resort is situated directly on the beach overlooking Hanalei Bay. The St. Regis Princeville Resort has a high-rise modern architectural style with 252 rooms that sport a modern Hawaiian decor. Guest rooms are 540 square feet with views of the mountains, gardens and ocean from a unique transparent glass reveal. This style of room is also available with a terrace for additional outdoor living space and the ocean view with terrace rooms are situated at pool level. Premium ocean view rooms are sized the same with a beautiful floor to ceiling window which features a sitting area for premium views of Hanalei Bay. The white sand beach area at St. Regis Princeville Kauai hotel is perfect for lounging and swimming is fantastic. Snorkeling can be found right offshore at the Anini coral reef and you can arrange your favorite watersport or land activity with the concierges. 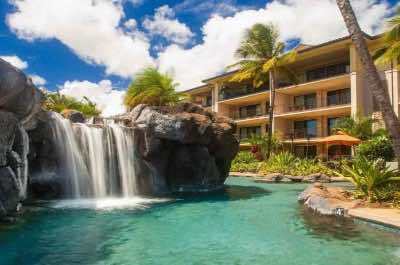 The St. Regis Princeville Resort is close to several attractions such as the Queen’s Bath. Princeville Ranch Adventures which includes ziplining and you can take a hike on the Kalalau Trail which is nearby in Koke’e State Park. You can go golfing at the onsite Makai Golf Course which has stunning views of Hanalei Bay and Bali Hai. Children will enjoy the onsite kid’s club which features a variety of activities for children of all ages. There is a fantastic freshwater Infinity swimming pool that overlooks the beach and Hanalei Bay with a gorgeous deck as well as poolside service from the Nalu Kai Grill and Bar. 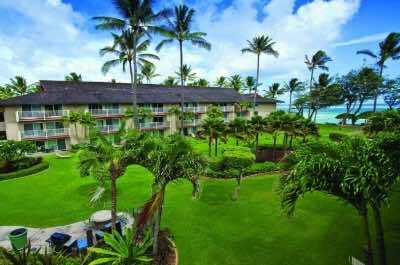 The t. Regis Princeville Kauai hotel contains a fitness center, kid’s club, shopping boutique and full service spa. There are four restaurants onsite at the St. Regis Princeville Resort which include the Makan Terrace which offers a superb breakfast buffet as well as casual cuisine for all three meals; Napali Cafe has sandwiches, the Nalu Kai Grill and Bar sports service for the beach as well as pool areas and the Kauai Grill is open for dinners that are prepared by chef Jean-Georges Vongerichten. Nightlife includes the Mailani Dinner show which features hula dances and live music as well as a relaxing evening at the St. Regis Bar. When you are looking for a great value and beach location in a Kauai Hotel, then you should try the Aqua Kauai Beach Resort. Located on the southeastern shoreline of the island near Lihue, the Aqua Kauai Beach Resort is situated on 25-acres of tropical landscape and directly on Nukolii Beach. The Aqua Kauai Beach Resort has a modern four-story architectural style with 350 rooms and suites that boast a contemporary decor. Guest rooms are sized at 320 square feet with a private balcony and views of the gardens, lagoon, mountains, pools, ocean and oceanfront. Deluxe guest rooms are sized similar with the same views selections and include upgraded room amenities. One-bedroom suites have 655 square feet with a separate living area and larger lanai with views of the pool, ocean or oceanfront. The one-bedroom Presidential suite has 1,253 square feet with a separate living area, Murphy bed and two private lanais that feature views of the ocean. Nukolii Beach is a long stretch of white sand that is ideal for lounging and walking. Swimming is hard at this beach but you are only minutes away from Lydgate State Park where you will find excellent snorkeling and swimming. You are also minutes from Lihue, the Wailua River where you can kayak and view Secret Falls as well as Wailua Falls. The Aqua Kauai Beach Resort has several activities throughout the day for singles, couples and families that include lei making, hula dance lessons, koi feeding in the fabulous lagoon and basic scuba lessons for guests. The Aqua Kauai hotel sports four saltwater swimming pools complete with waterslides, fountains and there is poolside service. There is a saltwater sand-bottom pool which is a favorite for children. The property has a fitness center, tennis courts, shopping boutique and a full service spa. Dining includes two restaurants which are Naupaka Terrace for a nice breakfast buffet and dinner service as well as the Driftwood Bar and Grille which serves poolside for lunch. Offsite dining options at this Kauai hotel include Hukilau Lanai and JO2 Natural Cuisine for Hawaiian dishes as well as Street Burgers. Nightlife is abundant at the Aqua Kauai Beach Resort with live music nightly at Shutters Lounge, wine tastings, fire pit chats and there is hula dancing at the pools. You can also visit the South Pacific Dinner and Theater which is just a short drive away. 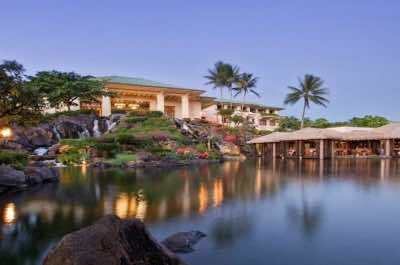 One of the best family-friendly luxurious Kauai hotels is the Grand Hyatt Kauai Resort and Spa. Located on the south shoreline of the island in Poipu, the Grand Hyatt Kauai Resort and Spa is situated on 50-acres of lush tropical paradise directly on Poipu Beach. The Grand Hyatt Kauai Resort and Spa has a low-rise Hawaiian architectural style with over 600 rooms and suites that boast a contemporary Hawaiian decor. There are two categories of service with upgraded amenities like a private lounge which includes continental breakfast and hors d’oeuvres in the evening. Standard rooms are large at 500 square feet with a private lanai that sports views of the gardens, pool, ocean or oceanfront. Grand Club rooms offer better views and additional in-room as well as resort amenities. Suites range in size from 1,050 to 2,813 square feet with a separate living area and expanded lanais with garden or ocean views. Although the white sand beach area at the Grand Hyatt Kauai hotel is rough for swimming, the lounging area is perfect for soaking up sun. You can venture a short distance to Poipu Beach Park and Shipwreck’s Beach for more ideal swimming, snorkeling and watersport activity fun. You can arrange your favorite land based tour with the concierges. You can horseback ride at CJC Country Stables, playa round of golf at the Poipu Bay Golf Course and you can take a stroll on the Koloa Heritage Trail or the Maha’ulepu Heritage Trail. The Grand Hyatt Kauai Resort and Spa has a full time entertainment staff that keeps things lively at the resort throughout the day with organized activities. There is a splendid kid’s club that features numerous events for children all day long. The property has three freshwater lagoon-style swimming pools with a lazy river, waterfalls and waterslides. There is also a swimmable 1.5-acre saltwater lagoon. The Grand Hyatt Kauai hotel contains a fitness center, kid’s club, shopping boutiques, tennis courts, saltwater lagoon and a full service spa. You have numerous dining options which include breakfast at the Ilima Terrace, Poipu Bay Clubhouse or Seaview Terrace; Tidepool’s serves seafood; Stevenson’s Library has grilled steaks; Dondero’s features Italian and poolside fare at Hale Nalu. Nightlife includes the Grand Hyatt Luau two nights a week as well as Stevenson’s Library and the Seaview Terrace for stunning sunsets. The Koloa Landing Resort is one of the best luxury Kauai hotels for families and couples who like added living space and don’t mind walking to the beach. Located in Poipu along the south shore of the island, the Koloa Landing Resort is situated off the beach on a hill overlooking the historic Koloa Landing. The Koloa Landing Resort has a modern three-story architectural style with all-suite accommodations that have recently been renovated in 2016. All units have a full kitchen and large lanais with views of the tropical landscape or ocean. Studios are 500 square feet and one-bedrooms have 1,000 square feet with a separate living room. There are two, three and four-bedroom villas that range from 1,300 to 3,600 square feet in size with well-appointed outdoor living spaces. Although not located directly on the beach the Koloa Landing Resort is a short 10-minute walk to Poipu Beach or Baby Beach Poipu where you will find plenty of space to relax and the swimming is good. You can also venture to Lawa’i Beach where you will find very good snorkeling and there are several surf schools within walking distance. The Koloa Landing Kauai hotel is ideally situated near the Poipu Shopping Village and the Shops at Kukuiula as well as a short distance from the Allerton Botanical Gardens. There are two freshwater swimming pools that include an adults-only and an excellent lagoon style pool with an island which is a favorite with children. Other onsite amenities include a fitness center, gas grills, free shuttle and a full service spa. Dining includes stocking your kitchen before or during your stay and there is a continental breakfast served daily at an additional cost. Offsite dining selections include Makai Sushi, Da Crack for Mexican dishes and the Eating House 1849 prepares Hawaiian fusion cuisine. In the evening you can try Keoki’s Paradise for music and a drink or go to one of the nearby luaus that include Aulii Luau or the Grand Hyatt Kauai Luau. If you are searching for a Kauai hotel which offers spacious accommodations and direct beach access, then you should book at the Marriott’s Waiohai Beach Club. 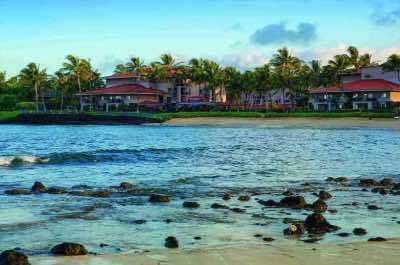 Located on the south shoreline of the island adjacent to the Kiahuna Plantation and the town of Koloa, the Marriot’s Waiohai Beach Club is situated on Waiopai Beach and within minutes of Poipu Beach Park. The Marriott’s Waiohai Beach Club is composed of eight modern style low-rise buildings that house 233 two-bedroom condos that were renovated in 2009. Two-bedroom condominiums have 1,120 square feet with two bathrooms, separate living and dining areas as well as a private balcony with views of the resort, gardens or ocean. Waiopai Beach is a nice spot for relaxing and surfing is good. You are just minutes from family-friendly Kiahuna Beach and Poipu Beach Park where swimming, surfing as well as snorkeling are great at both locations. You can arrange your favorite watersport activity with the onsite concierge or at the one of the beach vendors. You have a 5-minute drive to the Spouting Horn and the Poipu Shopping Village as well as the Moir Gardens are within easy walking distances. Children will like the pool features, the game room and a playground along with some organized activities throughout the day but there is no formal kid’s club. There are three freshwater swimming pools featuring waterfalls as well as a relaxation pool and there is a kid’s pool by the beach area. The property has a fitness center, game room, playground and massages are available beachside. There is no onsite restaurant at the Marriott’s Waiohai Beach Club Kauai hotel and you will find numerous options within walking distance such as the Anuenue Cafe for breakfast, Puka Dog for quick service and the Red Salt for contemporary cuisine. In the evening you can see a fantastic show and eat Hawaiian cuisine at the Aulii Luau which is within walking distance. The Kauai Coast Resort at the Beachboy is a fantastic value Kauai hotel for families and couples looking for a beachfront location. Located on the eastern shoreline of the island in Kapa’a, the Kauai Coast Resort at the Beachboy is situated on 8-acres of manicured grounds and directly overlooking the Pacific Ocean along the Royal Coconut Coastline. The Kauai Coast Resort at Beachboy has a modern three-story architectural design with 108 condominiums with a modern island decor. Studios are spacious with a small kitchenette and private lanai with a view of the gardens. One-bedroom condos are 690 square feet with a full kitchen, separate living room and private lanai that overlooks the gardens, pool or ocean. Two-bedroom condos have 1,045 square feet with a separate living room, a full kitchen and a private lanai with views of the gardens, pool or ocean. The beach area at Kauai Coast Resort at the Beachboy is rocky and is not swimmable but you can relax and soak in the sun. You are only a five-minute drive to swimming and snorkeling at Lydgate State Park. You can play a round of golf at nearby Wailua Municipal Golf Course, go shopping at Coconut Marketplace which is just across the street and you are minutes away from Wailua Falls as well as the Smiths Tropical Paradise. The Coast Resort at the Beachboy Kauai hotel has one freshwater swimming pool with a nice deck with natural rock features and poolside service as well as a separate children’s pool. Other amenities onsite include a fitness center, playground, gas grills, a tennis court and a full service spa. Dining includes lunch service poolside at Beachboy Pool Bar and dinner is found onsite at Hukilau Lanai which prepares excellent cuisine. Other offsite dining options are numerous with Eggberts for breakfast; the Lava Lava Beach Club is great for lunch and Sleeping Giant for fresh seafood in the evening. Nightlife within walking distance includes Trees Lounge is great for live music and the Luau Maka’iwa is ideal for island entertainment. If you are searching for a Kauai hotel that is situated directly on the beach with several added amenities for families and couples seeking romance, then you should try the Marriott’s Kauai Beach Hotel Club. 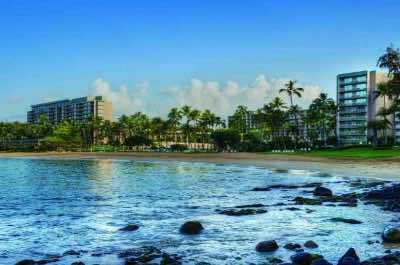 Located on the southeastern shoreline of the island in Lihue, the Marriott’s Kauai Beach Club is situated directly on Kalapaki Beach within a beautifully manicured tropical garden setting which overlooks Nawiliwili Harbor. The Marriott’s Kauai Beach Club has a high-rise modern architectural style with 356 rooms and suites which feature a contemporary decor. Guest rooms are sized at 314 to 379 square feet with a private balcony that sports views of the gardens, resort or ocean. Parlor rooms are sized at 357 to 379 square feet with a Murphy bed, small kitchenette and private balcony with views of the gardens or ocean. One-bedroom Villas have 628 to 758 square feet with a separate living area, one or bathrooms, small kitchenette and private balcony with views of the gardens or ocean. Two-bedroom Villas have 944 to 1,044 square feet, one or two bathrooms, separate living area, a small kitchenette and private balcony with views of the gardens or ocean. Kalapaki Beach is ideal for relaxing on either sand or grass and swimming as well as surfing is great. You can arrange your favorite watersport adventure with the concierge or directly through a vendor on the beach. You can play a round of golf at the Jack Nicholas designed golf course onsite or take a 5-minute drive to view Wailua Falls and snorkeling is 10-minutes away at Lydgate State Park. The property offers complimentary fitness classes as well as cultural events for adults and children during the day throughout the property. Marriott's Kauai hotel is a large freshwater swimming pool with four fountains which has a gorgeous deck for relaxing and five hot tubs as well as a children’s pool nearby. The property has a fitness center, 18-hole golf course, tennis courts and a full service spa. There are five restaurants onsite which include quick bites for breakfast at Aupaka Terrace; Kukui’s on Kalapaki Beach for breakfast and lunch; Duke’s offers seafood at lunch and dinner; Toro Tei prepares sushi for dinner and Cafe Portofino serves Italian dishes. Nightlife is limited to live music at Kalapaki Joe’s or you can visit one of the many luaus on the island including Luau Kalamaku and you can walk to Hawaii Alive!. The Garden Island Inn is a fantastic cheap Kauai hotel for travelers looking for value and proximity to the beach. Located on southeastern coastline of the island near Lihue, the Garden Island Inn is situated directly across the street from Kalapaki Beach. The Garden Island Inn has a modern three-story design with 21 rooms and suites that feature a bright island decor. There are three categories of accommodations which include Palm, Tropical and Orchid rooms. Palm rooms are spacious with a small kitchenette and a ground floor patio with views of the gardens. Tropical rooms are located on the second floor with a kitchenette and a private lanai which features partial ocean and mountain views. Orchid rooms and suites are larger and perfect for families with a variety of bedding choices, a kitchenette as well as a private lanai that has partial ocean and mountain views. There is also the Hale Kalapaki Condo which is a two-bedroom unit with 1.5-bathrooms, full kitchen and private lanai with views of Kalapaki Bay. The Kalapaki Beach is a gorgeous stretch of white sand that has plenty of room to relax and excellent swimming in the protected bay. Non-motorized watersports from kayaks to surf boards to standup paddleboards are available from a variety of vendors on the beach. You can also borrow chairs, coolers and other beach supplies from the Garden Island Inn Kauai hotel. You are centrally located in Lihue and daily activities could include a trip to the Grove Shopping Center, the Kilohana Plantation and Wailua River. The Garden Island Inn offers a variety of amenities such as snacks throughout the day as well as beverages and you are only a five minute drive to Costco for supplies. There is not a fitness center, swimming pool or restaurant onsite. Dining options are abundant within walking distance which includes the Kalapaki Beach Hut for Hawaiian specialties, JJs Broiler for seafood and Kikuchi’s serves Asian on the street. Nightlife is limited onsite but you are within walking distance to the fabulous Hawaii Alive! luau and show as well as Luau Kalamaku which is a short drive to the Kilohana Plantation. If you are searching for a value Kauai hotel for your family, then you should try the Courtyard Kauai at Coconut Beach. 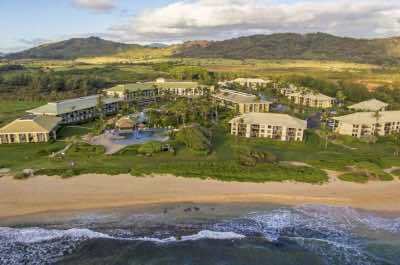 Located on the eastern shoreline of the island only 5-minutes from the town of Kapa’a, the Courtyard Kauai at Coconut Beach is situated directly on Coconut Beach. The Courtyard Kauai at Coconut Beach has a modern four-story architectural style with 309 rooms and suites that feature a modern decor. Standard guest rooms are 320 square feet with a private balcony and views of the gardens or ocean. Premium oceanfront rooms feature 528 square feet with a living area and an expanded lanai for added outdoor space. The Courtyard Kauai at Coconut Beach is located directly on Coconut Beach and you can relax while watching the waves. Swimming can be found 5-minutes away at Lydgate State Park where the snorkeling is also superb. You are conveniently located just minutes from Kapa’a where you will find many shops and restaurants. The Courtyard Kauai at Coconut Beach is just a short drive from the Sleeping Giant where you can hike to the top as well as Opaekaa Falls and the Wailua River where you can kayak upstream to Secret Falls. You can take a complimentary yoga lesson in the morning and there are some activities for children during the day around the pool area. The property has a nice freshwater swimming pool with a beautiful deck that has couches, hammocks and there is fire pits lit at night as well as colored lights. The Courtyard Kauai at Coconut Beach Kauai hotel a fitness center, fire pits, a game room and a full service spa onsite. Dining includes breakfast and dinner at the Voyager Lanai as well as lunch and happy hour can be found at the Maki Lounge. Offsite dining options include Kauai Pasta prepares Italian; Kintaro serves Japanese and Bubba’s Burgers. Nightlife at Courtyard Kauai hotel includes live music nightly around the fire pits and pool as well as a special luau performance complete with Hawaiian cuisine two nights a week.